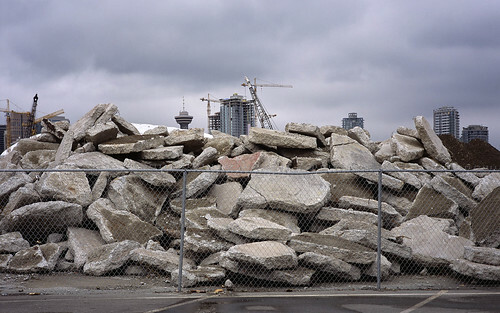 From the turn of the century until the 1960s, the False Creek site provided thousands of now-vanished blue collar, soft industrial jobs; by 1986 the emptied land tracts and “defeatured” open spaces became a World’s Fair. Today this site is a monumental project of upscale eco-friendly condominiums built for the 2010 Winter Olympic Village. Architecturally, this is a lackluster and conservative, city-planned enterprise of what should have been a dynamic example of urban renewal. These images reveal many things, not the least of which is a value system in a sliding scale of opportunism. There is, however, a Vancouver tradition of early photo scanning and indexing of the late 1960s and 1970s of this defeatured urban landscape, which took on a critical discourse of urban expansion. The referencing to the earthworks and arte povera genres of material spills and piles of industrial and natural material radicalized the way we consider art, and especially sculpture. These piles of dirt and detritus now signal themes of urban anxieties, of both social and environmental distress. and gentrification. The framing and picturing of my experience of this part of the city – of what lies under the urban surface – offers a very different perspective from that of the urban planners who define and communicate an “expert’s” experience of my city. My intention, instead, is to provide, beneath and through the picture plane, an exploratory and perhaps even unprejudiced representation of this cultural leveling of place. In these photographs, the city looks and speaks to us through these shrinking, cracked, and fissured spaces, taking shape while constantly changing. This picturing of the routine of urban nomadic homelessness occurred during the construction of the Olympic Village. During that time, my studio building was being converted to a homeless shelter on its main floor. There were occasions when I observed squatters, drifters, and those homeless who choose not to stay out of harm’s way in the provided safe shelters. This invisible city dwelling class1 would begin each day like the last: awakening, bundling and tidying up their gear, going out in search of nourishment, and then returning to look for a new spot with the same provisional domicile as before. And so, what at first appeared to be sites of hopelessness may in fact be sites of resistance, and the individual’s tacit independence from the mechanisms of city life; the refusal to be leveled by the city. Abandoning one’s self to drifting through the uncertainty of life in this part of the city reminds me of what Georg Simmel mentioned in his 1903 essay, “The Metropolis and Mental Life.” The alienated and impersonal not-at-homeness of self in the open city bears similarities to the autonomous drifter – “us” as the individuals, the drifters in the crowd. As urban citizens, the mental attitude of one to another is formally designated as one of reserve and cosmopolitan loneliness, i.e. walking alone and lost in the noise of the city. We are immersed in an overwhelmingly powerful experience, where the city becomes interiorized. The transience of things and our experience of this transience return to us in how we define a self-conscious and self-building individualism. The modern city seems to exhaust an individual’s resistance making us wanderers who nervously go about the city. The individual underclass of drifters appearing in open spaces and abandoned land tracts is in close proximity to the site of the architectural skyline of the narcissistic city. The empty spaces and places are contrary to and a resistance against the mechanisms and control of the planned city. They haunt us with their singular existence. The idea of rethinking the city as an object of desire, of collectively dreaming or to pondering the nightmare of new topographical and open, speculative urban spaces, is where the imaginary starts. 1. A hobo was a wanderer who sought work; a tramp is a dreamer and wanderer; a bum is a drinker or doper and wanderer; and the pedlar a now extinct class of wanderers brought news, knowledge, and desired goods to the communities that he or she visited. From Henderson 2008: 76. Henderson, Lee. 2008. The Man Game. Toronto: Viking Canada. Simmel, Georg. 1903. “The Metropolis and Mental Life.” In Richard Sennett (ed. ), Classic Essays on the Culture of Cities. New Jersey: Prentice Hall, 1969.